Working to support the financing, construction and refinancing costs for quality healthcare and educational facilities in Maine. 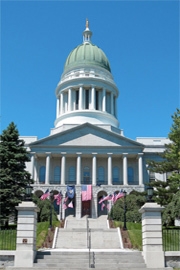 The Maine Health and Higher Educational Facilities Authority (MHHEFA) provides eligible non-profit colleges, universities and licensed healthcare facilities access to capital markets by issuing low cost, tax-exempt bonds and lending the proceeds to finance or refinance the acquisition, construction, and renovation of facilities. Tax-exempt bonds issued through MHHEFA result in interest rates that are much lower than conventional bank financing. MHHEFA is also the co-sponsor of the Maine PowerOptions program providing electric aggregation services to our eligible borrowers as well as the chance to purchase fuel oil as part of a bulk purchase program. The next MHHEFA board meeting will be held on Friday, May 17 at 9:00 AM at the Maine Municipal Bond Bank in Augusta. Every few years the Authority puts together a trends and analysis package. Click here to review the measures and performance package compiled in December 2018. In 2011 MHHEFA financed their largest stand-alone deal, loaning $280 million dollars to MaineGeneral Medical Center for a new hospital in Augusta.